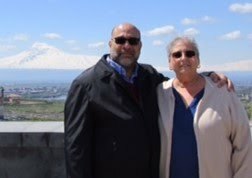 Last week I heard from Ron Takakjian, one of my Dikranagerdtsi cousins. He wanted to share a kufteh preparation method he’d never tried, and wanted my opinion about it before he gave it a go. An Italian friend of his suggested he make kufteh like one would make ravioli. What Ron’s friend said was this, “Instead of cupping the outer shell in your hand and forming it around the stuffing , try rolling the outer shell till it is paper thin, and with a cookie cutter, cut into circles, add filling, then top with a larger circle. Ron said he’d try the technique over the weekend and let me know how it turned out. 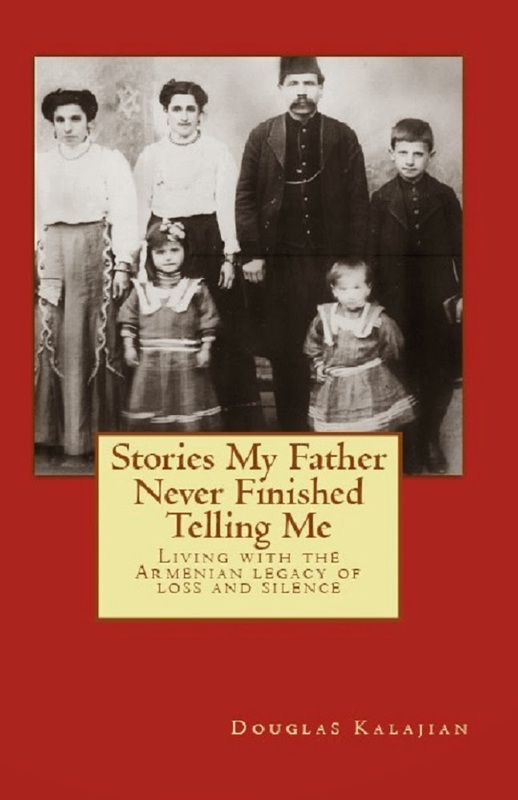 Ron used his maternal grandmother's (Aroosiag Najarian) recipe that his mom jotted down over 50 years ago. Ron’s updated technique follows his grandmother’s recipe. 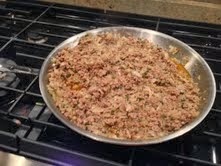 Sauté meat in skillet with butter and ¼ cup water until it simmers and becomes tender. (Water should evaporate; only fat should remain). Cover and cook over low heat, stirring frequently, for 30 to 45 minutes. Mix ingredients – add a little water and knead until it is a smooth mixture. 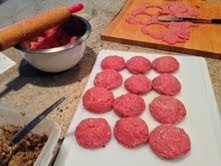 Add a tablespoon of filling; bring edges together to close. Seal top completely and pat with both hands. The kufteh should be flat on the bottom and round on the top. Keep water handy – you have to work with dampened hands. Place kufteh on wax paper. Drop kuftehs in boiling salted water without overcrowding the pot. When they float to the top, they’re done. Using a rolling pin, he rolled out half of the outer shell’s meat-bulgur mixture on a wooden cutting board and with his hands flattened the mixture until it was very thin. 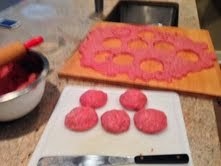 With a large, round cookie cutter, Ron cut the outer shell mixture into circles. With one thin patty in his hand, he added one heaping tablespoon of filling in the center of the circle, and placed a second circle of the outer shell mixture on top. Ron wet his hands and pinched the edges together to seal shut. He repeated this procedure with the remaining ingredients. Ron found that the outer shell was not as dense using the “ravioli’ method. Many thanks to Ron for doing the work and sharing this experience - and to his Italian friend for offering the wonderful suggestion! Congratulations to Ron, a multi-talented gentleman. I remember the Najarians and Takakjians very well. There were Aram, Haig (Hyo) and Elizabeth (Mumsy). And there were John,and Satenig, and also Elizabeth (from Brooklyn). I remember Ron's appearance, when he was quite young, in a piano recital where he played a Prelude by Gershwin. I remember because my son, Antranig appeared on the same program. My brother, John, and I filmed silent movies of the old gang in Union City as well as Belmar. I converted them to a videotape, and gave a copy to Mumsy quite a few years ago. Someday I may put it up on YouTube. I strongly encourage you to post those priceless silent movies on You Tube. What a fantastic BlogSpot! Thanks for the recipe!